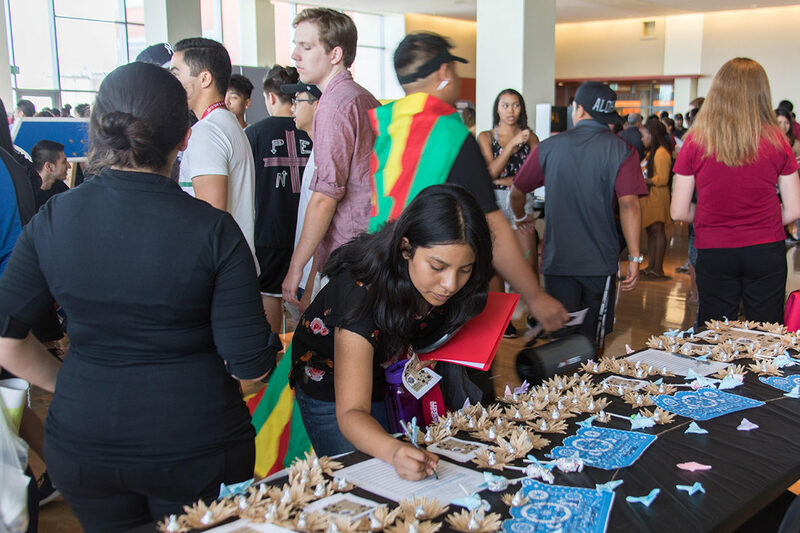 Students connect with student leaders and mentors and learn about campus resources and ways to become engaged during Conexion, an afternoon orientation hosted by Multicultural Student Services. As the new academic year begins, progress continues toward addressing the needs identified as a part of the WSU Campus Culture and Climate initiative. All five work groups are in various stages of assessing existing resources across the WSU system while concurrently focusing on actionable items. Nolan underscores that the working groups were developed to implement specific actions as well as improve processes. For example, this past spring the Cultural Competency working group conducted a survey that sought to document campus climate issues and what individuals should know about diversity, equity, inclusion, and justice. The survey received nearly 900 responses, and the feedback is being used in the development of a statement of core learning goals and values, a resource page, and the creation and oversight of existing and new training. In the meantime, the working group is currently coordinating with the Office of Equity and Diversity to leverage existing education opportunities and refining the Social Justice Peer Educator program. Students, faculty, and staff will see an increased number of training opportunties, and many will be made more accessible through livestreaming. Those interested in requesting a workshop led by a peer educator or finding other training options can visit the Office of Equity and Diversity at diversityeducation.wsu.edu. Webpages for all campuses will be updated with information by August 22 that includes gender inclusive restrooms, locker rooms, and facilities along with comprehensive facility information that includes ADA accessibility and changing stations. Nolan notes that a system to streamline working group recommendations is in development and will enable the groups to share their progress more widely. Opportunities are available for students, faculty, and staff to work alongside their colleagues on the working groups. Individuals who are interested in contributing their time and expertise or are passionate about one of the five areas are encouraged to submit their information along with the name of the group in which they feel they can bring valuable insight. The Campus Culture and Climate working groups have been meeting formally since the spring with charges of reviewing and addressing needs system-wide as related to Executive Policy 15; cultural competency; campus cultural and resource centers; diverse faculty and staff and gender inclusive and trans* support. All told, the groups are comprised of more than 110 students, staff, and faculty from across all six campuses. Those interested in learning more about the progress to date can visit the working group website where overviews, meeting minutes and links to resources are published: studentaffairs.wsu.edu/initiatives/campus-culture-climate. Jaime Nolan, associate vice president for community, equity, and inclusive excellence, Division of Student Affairs, 509-335-3532, jennifer.nolan@wsu.edu.